Big garden event – the cherry tomato plants have blossoms. Not many, but some starting. All of the plants seem to be doing just fine and giving hopes of a bumper crop. The winter stuff is bolting rapidly – two weeks of upper 80’s will do that. We usually see this in April so it’s way ahead of schedule. We’re eating our little hearts out but don’t stand a chance of catching up. We could eat a meal of cabbage every night; a meal of peas every night; a meal of broccoli every night; a meal of chard, a meal of kale, a meal of spinach every night; and a salad with every meal, including breakfast, and still not keep up. Cauliflower gone. We’re not canners and really prefer it all fresh rather than frozen so it’s eat, eat, eat. Nancy has several meetings going this week and she likes to carry bags of goodies for the girls so that will help thin out some of it but nothing like it needs. Someone noticed that the Tyfon (AKA Holland Greens) growing in the garden were sporting roots that looked exactly like turnips. I dug one up and sure enough it looks like a turnip – globular with a purple top and white bulb. One person I had given the greens to had complained that they were “hairy” so I was just wondering if I could salvage the crop by using the turnips. I called the seed company and talked to one of their experts who read some customer comments to me. A couple said they were “hairy” unless cooked. At that point they were reported to be better than spinach and way better than mustard greens but absolutely no comments on the turnip roots. I went to the internet and found reference to “stubble turnips” and that the roots of the Tyfon were similar to stubble turnips and were grown in Europe for cattle feed – the roots, not the greens. My plan now is to dig up the roots and give them to Nancy’s quilting buddy with the cows and see if we can do a turnip for beef swap downstream. As far as the greens go, Joey said they were delicious cooked so I think when I pull them for the roots I’ll donate the greens to one of Nancy’s bridge buddies with the stipulation that they be cooked. Actually I did eat some raw but as part of green smoothies and they tasted fine – lost in the blend – so I guess the ninja blender chopped up the “hair”. Boy the celery is really taking off. Never grown this particular variety but so far, so good. We need it to cool off a bit. On the other hand, I’ve experienced a complete crop failure in the corn department. Wonder if it will impact ethanol futures? If you may recall I had planted between 150 and 200 corn seed and was starting to see some germination. Well it never amounted to much so I decided to very carefully remove the soil over the seed to see what was going on underground. Nothing. No seeds. I think I mentioned seeing quail in the garden. I’m now thinking these were corn fed quail. Luckily it’s still early in the season and my local ACE hardware carries bulk seed so I picked up a bi-color variety called peaches and cream. I haven’t seen the quail in a few days so maybe they’ve moved on. To close off on the corn, it literally germinated nearly 100% in 6 days. That’s more like what I’m used to and why I was nervous when that didn’t happen with the first batch. An update on the tomato top I’d planted after it was cut off by a cutworm. It stayed green for a few days but really looked wilted and almost flat on the ground. 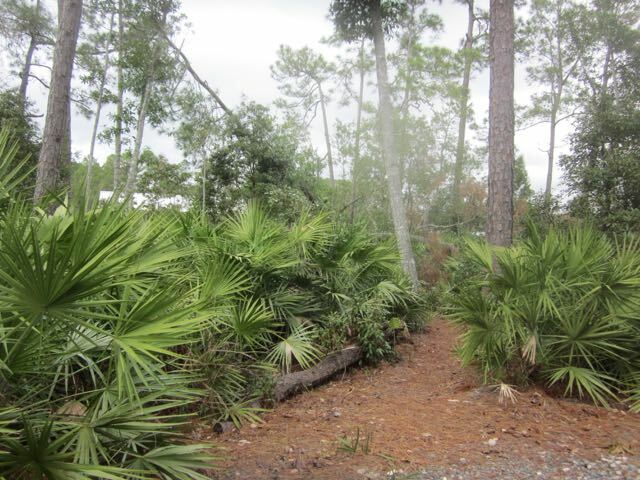 I kept it moist and added a couple of palmetto fronds to shelter it from afternoon sun. This morning it was standing straight and looking very much alive so perhaps it’s recovering. And if I gave you an idea that all of the tomatoes for this season had been planted, that’s not exactly right. I have all the main crop tomatoes planted – those are the ones we count on for late spring and early summer. This is when we get most of our spaghetti sauce and all matter of tomato dishes so I really deal with these carefully and select only tried and true (by me) varieties. But I also start some experimental/specialty varieties that may or may not make it. This year I have a seedless tomato, a low acid tomato, and one advertised to be able to handle ultra hot moist climates. We’ll see. Usually these experiments don’t pan out – can’t handle our weather or the nematodes or other local critters but every once in a while we hit a big winner. I have two new pepper varieties and a new egg plant going in soon. It’s spring break for Tom and we usually head south for a fishing/camping trip. This year we decided to change it up and fish locally, using our house as home base. That gives us much more flexibility when the weather acts up. We fished several different places with close to zero luck – but the weather was just fine. Having said that, I nearly burned to a crisp on day one by forgetting my hat. I coated myself with aloe as soon as we got back and that worked it’s magic – no residual pain or red coloring the next day. One day Tom took his mom to a spring training baseball game. On Friday, Simon came back to Florida for a couple of days and we got to spend a night with him catching up. Right now it looks like he’ll be spending the summer at Coosa River in Alabama but that could change if a full time teaching position opens up in Florida (or Alabama). I have all 15 tomato plants in the garden; Actually that’s 14 1/2 plants. One of the dangers facing newly planted seedlings is a critter called the cutworm. They come out at night and eat a ring around the base of the new plant so you go out and find it mowed down. There’s a standard approach to combatting them by encircling the stem with a cardboard collar but I end up breaking the plants while messing with the collar. Anyway, one of the cherry tomato plants was chopped down by a cutworm. I took the top of the plant and stuck it in the ground with the hope that it may take root- sometimes that works. After one day it looked like this wasn’t going to work but after three, maybe it will. In any case, if I had to lose a plant, best that it was a cherry tomato. The variety is so, so productive that we keep the neighborhood and friends totally satisfied with 2 plants. Also I literally pull hundreds of renegade cherry tomato plants- starting now and throughout the season – so I’ll let a couple of them survive and if the cutworm victim doesn’t survive, I’ll pop a renegade in it’s spot. I also started planting jalapeño peppers, 3 out of 7 plants now in the main garden. I didn’t plant them all just in case the time or spot is a problem. If everything looks good in a few days, I’ll finish off the rest of the plants. This is a new variety called Mucho Nacho and it sounded good – large, meaty variety of medium heat – best for making poppers or so the catalog advises. Normally I plant only 3 or 4 and that is sufficient for all of us but I always start more than I need and give the spares to Joey or a friend of Nancy’s. Turns out neither of them wanted jalapeños so I’ll have an extra large crop this year. That’s really ok with me since we always pickle several jars and it’s never enough. Barbara also pickles but for some reason didn’t last year. She assures me this year she’s going to be a pickling queen. We’re in a serious cauliflower overload mode now. 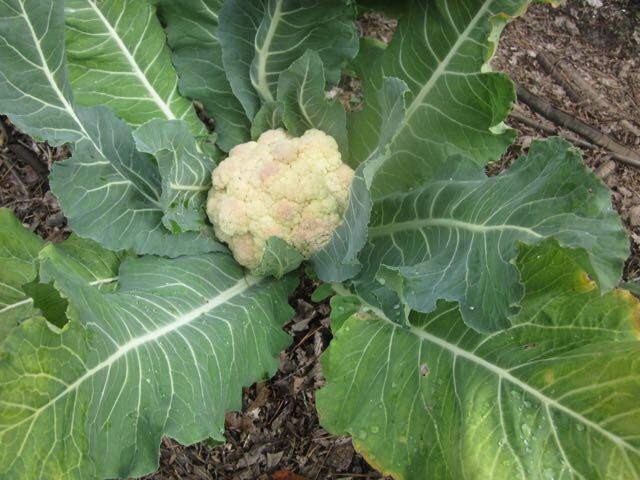 Nancy made roasted cauliflower soup the other night and we have a recipe for broccoli-cauliflower salad on the agenda. Also spotted a recipe for a cauliflower salad that is identical to potato salad sans potatoes. We make a veggie mix at Thanksgiving mashing carrots and turnips together, an old family recipe. I’m wondering if it would work to replace the turnips with cauliflower. The pic shows one of the current crop about to be cut. Pineapple update – Of the 6 plants started, 1 died right away giving me hope that those that didn’t die instantly were more likely to make it. Two of those are clearly living and putting out new growth but the other three seem, at best, to be clinging to life; that means still green, but clearly not putting on new growth. I’m not going to pull them out so long as there’s hope. In the process of losing another pine tree by having it topple over. We’ve had so much rain and the lake level has been high for so long that the ground down by the lake is soft and when a good wind catches the tree it pushes it over. This pine was tilting about 30 degrees (from vertical) a month ago, then sagged to 45 and is now approaching 60. I’m guessing it will just continue to gently drop. The photo shows it at the 30 degree point a few weeks ago. It’s falling away from the dock so I’ll just let nature take it’s course. This is a picture of a pine tree gently toppling over down by the lake. The high water has softened the ground so that it didn’t take much wind to blow it over. It’s taken a couple of weeks to get to 60 degrees from vertical and will no doubt be horizontal, on the ground, soon. Good progress in the garden. The corn started popping out and about half the tomato plants have been transferred to the garden. The corn was projected to germinate in 7-10 days and actually made the first appearance in 8 so right on schedule. If all holds, that will translate to corn by May 15. I have to admit to having germination anxiety – will they or won’t they. I picked 4 cauliflowers and 2 kohlrabi this week and promptly replaced them with tomatoes. As of this date 12 tomato plants are “home”. Also planted 2 rows of pole beans. The computer says we’ll be eating beans by April 25. No signs of the cucumber or squash plants yet but I won’t panic for a few more days. I also have 16 pepper plants in a flat waiting for garden space. They can stay in the flat for another couple of weeks before I have to either move them to larger containers, aka yogurt cups, or into the garden. I’m starting to eye the Tyfon patch and a beet patch as possible pepper homes. The Tyfon has not been a customer favorite so it may be history sooner rather than later. This variety of beets has been less than spectacular as well so no great loss there. I also have a lettuce patch that can become home to 4 peppers as soon as I pull the lettuce. Plenty of customers for that. One restriction you have with peppers is that you are supposed to keep some separation between varieties to avoid cross fertilization. We’re really experiencing a roller coaster weather pattern. It was lousy last week but most of this week has been in the 80’s only to be dashed by more cold weather today – back in the 60’s. Today is the official start of Bike Week so a little cold and rain will keep that action subdued. We keep well enough away from Daytona, action central, but the bikers spread out and there’s a background roar all around. Right after bike week, the beach is taken over by spring breakers. The word around is that Cocoa Beach may be the preferred venue this year, hopefully sparing Daytona. Tom and I have a fishing week next week so I’m hoping we get reasonable weather. In past years this spring break trip has been washed out or blown away with gale force winds. Almond milk vs cashew milk. For a couple of years I’ve been using almond milk in my morning cereal. I don’t have any particular problem with dairy but so many people I know do that I just figure it’s an ok thing to limit. My taste buds have long since died off so I don’t taste much (if any) difference. Today when making my noon time green smoothie I noticed that my bride had switched out the almond milk for cashew milk. I looked at the ingredient label and really didn’t spot any differences so I took the plunge. Just as I suspected, couldn’t tell the difference. I can see where it would be a little off-putting because it has a brownish color as compared to white but whichever is on sale………….. The Burmeister’s visited last week and we had a really nice time. The weather could have been better and we didn’t get any fishing in at all but we somehow filled the time, catching up. One place we went that probably would have been skipped if fishing was a play, was the new art museum in Daytona. I’m not a big art museum guy but this one is 100% focused on Florida art – art depicting Florida or created by Florida artists. A good bit of it was pre 1900 so it gave you perspective as to life back then. They had a single display room dedicated to art in Volusia County, our county, and another for Daytona exclusively. There was even a great painting of Sopotnik’s – the bike week venue famous for female cole slaw wrestling and wet T-shirt contests where the wetting liquid is usually beer. We liked the museum so much that we converted our one day entrance ticket into an annual pass. It does finally look like perhaps winter is done. The forecast for the next 10 days has the highs in the low to mid 80’s and the lows in the 60’s. That will trigger a load of new planting in the garden. Just in time the cauliflower is ready or close to picking and that row converted to tomatoes. Just in time the broccoli raab has bolted and will be replaced with squash seeds right away. Just in time a section of snow peas is done and will be replaced by pole beans. I’ll pick the last of the kohlrabi midweek and put in the final cherry tomato plants. In other words the whole garden will be transforming in the next couple of weeks and carrying us through June in goodies. I’m facing a bit of a personal crisis. I seem to be shrinking, slowly but surely. Since I’ve lived my life with plenty of spare body mass, I’m in no danger of fading away but I could eventually reach the point where I’m not technically overweight. The crisis is this. About 20 years ago I bought a belt in Durango Colorado which really caught my eye. It was a 40 and at the time I really had to squeeze in to make the first hole in the belt – it was really too small but they didn’t have the one I liked in a 42. Now I’m down to the last hole and have to start thinking about drilling new holes. I can probably get away with adding another one or two holes but beyond that it will start looking strange. I’m trying to drink more beer to avoid the tragedy of losing the belt.